I had two goals for this artist residency. First, I wanted time to create work that tested my tenuous connections to an ancestral environment. For this objective I had plans set before I arrived. Second, to have the chance to react spontaneously with a specific and unknown location. The island is four miles from the mainland and is accessible only by private boat or a mailboat that comes to the island twice a week. During the spring, while I was there, there were only four other people on the island, two of which were other artists-in-residence from the Netherlands. 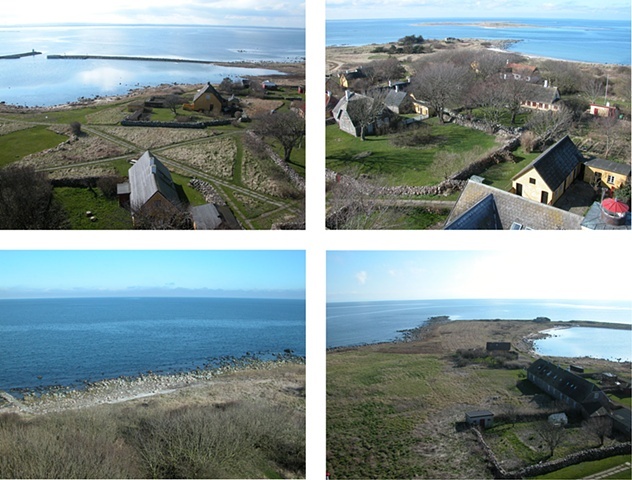 The remoteness, small size of the island, and being in Denmark, one of my ancestral countries, made Hirsholm Island an ideal place to pursue these objectives. 1. The view to the west with the Danish Coast on the horizon. 2. The view North including the majority of the village, the northern German bunker and the next island in the archipelago. 3. The view to the south including the southern German bunker and the rest of the village.